Select MDKB, TVDSS, or TWT to display the well in that domain. In TWT, the log data is transfromed to time using the well time-depth set. Select the Current Well from the dropdown search box. You can also use the mouse-scrollwheel to scroll through the available wells in the session. To import wells, see Loading Wells. Note: Only enabled wells are selectable in this view, please ensure that indicator of the well is lit green to ensure that it is viewable. Read about activating/deactivating items. The Display tab allows you to manage well curve templates and well selections, and adjust settings for the entire view. Templates can be exported to files and re-imported. These files can be shared between users, projects and sessions. Read more about Working with Templates. Font and Font style: make adjustments to the font, size, and style of the text. 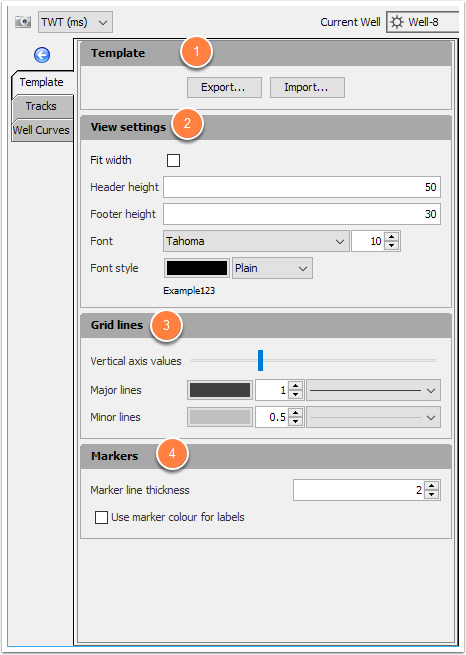 Adjust the Vertical axis values scrollbar to increase/decrease the vertical time/depth domain track value or change the major/minor lines size, colour and type. Change the Marker line thicknes and click the checkbox to use similar marker colour for all labels.